And finally it’s vacation time. We’ve been waiting for this vacation since so long… I can almost sing “All my bags are packed, I’m ready to go” :). I was quite easy with buying gifts for all the younger kids – toys, story books, clothes. But a gift for Faaiz was not easy. He is growing up…. He is 10! And I didn’t want to buy any Noddy or panchtantra for him…. I didn’t want to buy him hungry hippos or similar toys… And he already has most of the games on ‘his iPad’. So what could I gift him? I think Faaiz is of the age when he will have questions of how was world formed? Where did we come from? Why do different people speak different languages etc etc… Being a smart kid and living in a digital age; I won’t be surprised if he has already found a website that answers all these questions for kids :). 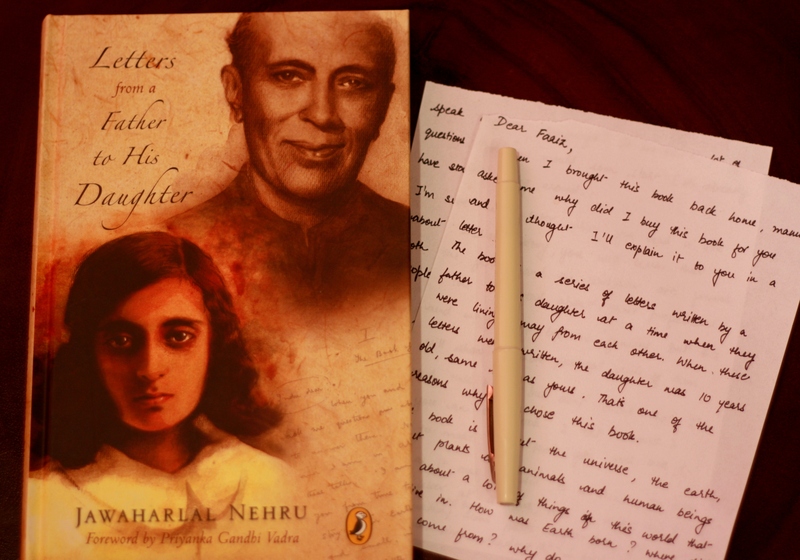 But I still wanted to give this book… This book is a series of letters written by Jawaharlal Nehru to his 10 year old daughter Indira. Apart from fuelling a lot of inquiry, this book presents the lovely notion of letters! An art that has been completely forgotten in the age of emails. It also presents a more personal side of Nehru and Indira Gandhi’s upbringing. I’m not sure whether Faaiz knows who Jawarhal Nehru or Indira Gandhi are; living in the US, I’m not even sure if he will ever read about them in school; but I’m sure, being an Indian, one day he will know who they are or after this book he will want to know who they are. I read the book before gifting it because I wanted to make sure he will enjoy it. The letters travel from the big bang – the beginning of solar system, to how life slowly developed over millions of years; how man from being the weakest animal became the master of all; the beginning of civilizations, trade, language, currency and politics. To me this book was a refresher of what I’ve studied long ago in history classes and also a revisit to a lot of museums I’ve been to. I could picture the ancient coins I’ve seen in museums, the tools early man used, the Egyptian tombs and mummies… The illustrations will definitely add to a child’s enjoyment of the book. For a 10 year old, this book will open new doors of knowledge. I hope it will lead to questions, inquiry and wonder. Towards the end the letters might confuse the young mind as things move very quickly. There is suddenly too much information; too quickly, which is bound to happen… as Nehru himself says “when you cover millions of years in a few letters”. The letters should be read as they were originally meant to be read –one at a time. Thank u for your sharing abt this book as i found this book in our library too and was thinking how will it be. . nw i will surely read it . .Love all your sharing . . Thanks trupti! It’s a beautiful book… and it’s amazing how Nehru ji is actually talking to Indira not like she is a 10 year old kid but a future leader!